Getting there: To access the pass from the western side, there are three options. The most popular approach is from just south-west of Willowmore, where you turn off the tarred N9 at GPS S33.320801 E23.460367 onto the R332 (gravel). The road is clearly signposted 'Baviaanskloof.' 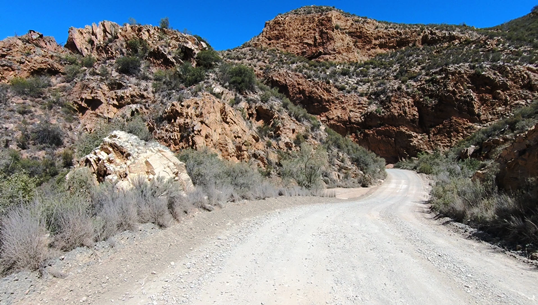 Remain on this road for 34 km to arrive at the northern starting point and summit of the Nuwekloof Pass. 1. Drive north-east from Uniondale on the N9 for 10 km and turn right at GPS S33.575951 E23.167767. Follow this gravel road (P1840) in an easterly direction for 50km till it forms a Y-junction with the R332 at GPS S33.485345 E23.618099. Turn sharp right here and drive south-east for 3 km via a big S curve set to arrive at the northern start of the pass. 2. Another excellent option is to drive from Uniondale in a north-easterly direction on the N9 for 27 km and turn right onto a gravel road (P1843) at GPS S33.488727 E23.287485. Drive east on this road for 20 km till you arrive at a T-Junction at GPS S33.496497 E23.472674. Turn left onto the P1840 and head east for 15 km to arrive at a Y-junction with the R332 at GPS S33.485345 E23.618099. Turn sharp right here and drive south-east for 3 km via a big S curve set to arrive at the northern start of the pass. The final river crossing just after the southern end of the pass / Photo: Trygve RobertsFor those approaching the pass from the east, the navigation is straight-forward as there is only one main road. The southern start of the kloof is reached about 5 km after you have passed the entrance gates to the Uitspan farm. We filmed the pass from north to south and describe it in the same direction. 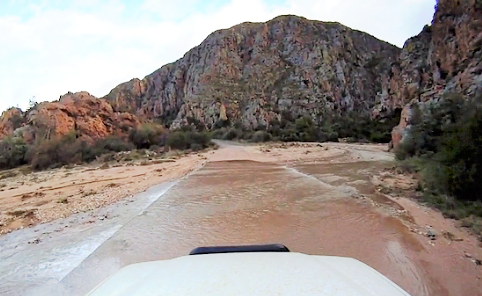 This is the first pass you will encounter when driving the Baviaanskloof from west to east. 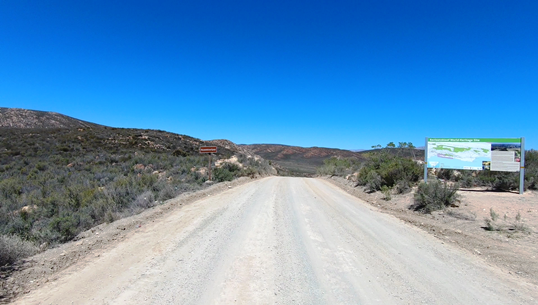 The northern start is preceded by a wide S-bend and marked by a small signboard on the left and a much bigger information board on the entire Baviaanskloof on the right, which is at an altitude of 1066m ASL. Stop here and orienteer yourself with the various zones, access requirements, historical points of interests, geographical information and other items of interest. Do this especially if it is your first visit to the Baviaanskloof. The pass contains many sharp bends and we recommend a maximum speed of 40 kph not only for your safety, but to enable you to enjoy the stunning scenery. Stop often and enjoy the majesty of the rock formations and the sense of complete isolation. The route crosses the river multiples of times. What is a dry river-bed in the drier seasons, becomes a raging river after heavy rains, which should be tackled with caution, experience and preferably in a 4x4. This poort has a steep run-off gradient and the flood waters will generally subside in a few hours. One of the 14 river crossings / Photo: Rehan OppermanIf you are uncertain whether it is safe to cross any one of the river crossings, and you are not prepared to risk walking it as an "acid test", then rather back-track or wait a while for water levels to subside. It is never worth the risk of losing your vehicle or a life (and it does happen more frequently than what you would imagine). However, a normal sedan car will comfortably manage the road during dry weather. You will cross over the river 14 times due to the road's approximation to the river throughout the length of the poort. The top of the pass levels out at 1066m ASL which effectively means that snow can (and does) occur at the summit from time to time. This poort stands sentinel over the western entrance to the Baviaanskloof and is a fabulous introduction to the wonders of the Baviaanskloof for those travelling eastwards. 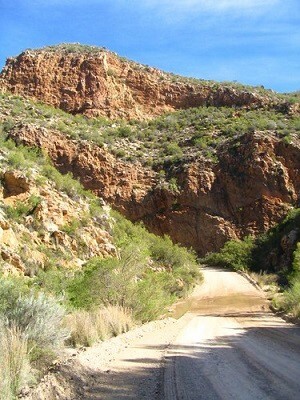 The geology throughout the poort is magnificent and the 5,9 kms is over all too soon. We strongly recommend a few stops withing the poort to allow the beautiful scenery to sink in. Even better, if you have the privilege of walking or cycling it. It is especially beautiful to drive eastwards just as the sun is setting. For west-bound travellers it is a final and fitting farewell after more than a hundred kilometers of perpetually changing grandeur, ranging from arid plains and rocky mountains to lush green sub-tropical riverine forests with deep water crossings. Look out for a sign marked RAASKRANS which translates roughly into "noisy cliff". Stop here and bellow your heart out and see what happens. The kloof becomes ever narrower as the road is forced to follow the convoluted path of the river. Through the middle part of the kloof you will be treated to amazing sandstone formations of gnarled and contorted rocks. As the pass exhibits a fairly gentle descent gradient of 1:30, the average driver might not realise that a whole lot altitude is being lost - exactly 200 vertical metres of it, but as it is over a long distance, most people are not aware of the altitude change. The geology inside the kloof is mesmerising and you will be hard pressed to pick a favourite view as these come thick and fast thoughout the traverse. The dominant rock type is Cape Fold Mountain with some amazing sandstone formations. Probably the most interesting is Raaskrans or Noisy Cliff. This is a 40m high vertical cliff which completely overshadows the road on the right hand side (descending) immediately after one of the river crossings. Pull over as far off the road as you can and take a walk around and get some great photos to take home. It's an unforgettable place. For the vast majority of the year the many drifts will either be dry or have a small amount of water in them, requiring only a minor alteration in speed, but from time to time the kloof gets enough rain to turn the little river into a raging torrent. Never take chances and if the first two crossings look dubious, rather turn around or wait a few hours for water levels to subside, as the corssings get ever deeper, the further down the pass that you drive. Cautionary: Most drivers enjoy charging into a river crossing to see how big a splash they can create. Whilst this might seem like fun, it is actually not clever at all. Firstly you are assuming that there are no hidden objects under the water surface and secondly, it takes only a few drops of water to get into your vehicle's electronics to render it useless. That will more than likely equate into an expensive recovery and a spoilt holiday. Always drive through water at a slow speed. It is only when there is deep mud, that some momentum is required. In all other cases, cross slowly. The kloof gets a little wider near the southern end where it opens up onto the wide valley of the Western Baviaanskloof via a sharp 90 degree left hand bend. This bend marks the southern end of the pass at an altitude of 866m. Here the almost desert like topography is quite different to the upper areas traversed during the approach. You now have a long and fairly flat, but winding traverse into the east, where you will pass Uitkyk, Duiwekloof, Makedaat Caves, Speekhoutkloof, Vero's Restaurant and more before you arrive at the next pass, which is Studtis Poort - a distance of about 35 km. Things to do and accommodation? 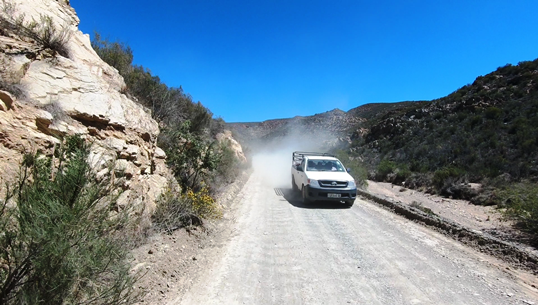 Click here: Baviaanskloof Overview and Orientation video.